Hardcover, 9.5 x 11.5 in. / 200 pgs / 200 color. Text by Francisco Calvo Serraller, Antonio López García. The Spanish artist Antonio López García is revered worldwide not only for the extreme realism he brings to his paintings and drawings, but because he conveys through this extreme realism a wonderful sensitivity to light, color and space, enabling each to breathe with a tranquility that allows for the encroachments of everyday life. 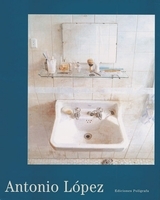 Interior scenes of dining tables, bathroom sinks, toilets, dressers are depicted in sober light that recall Chardin or the intimisme of Vuillard--though López García surpasses even these masters in his ability to make unforgivingly prosaic subject matter, such as a brick wall or a refrigerator, sparkle and throb with mood. The artist's statement that "you work until the whole surface has an expressive intensity equivalent to what you have before you, converted into a pictorial reality" conveys something of the labor he brings to his works: López García is not a prolific artist, and as a result shows rarely (his 2008 exhibition at the Museum of Fine Arts, Boston, consolidated his already strong audience in the U.S.). His drawings and paintings are equally esteemed, but until now, the drawings have never been the subject of a monograph. All of the work in this superbly designed publication has been carefully selected by the artist's daughter, Maria; much of it has never been reproduced until now. Including 200 color plates and a moving text by the artist himself, it stands as a powerful testimony to López García's astounding achievement. Antonio López García (born 1936) studied at the School of Art in Madrid in the early 1950s, and quickly became part of a nucleus of realist painters, such as Francisco López Hernández, Amalia Avia and Isabel Quintanilla. 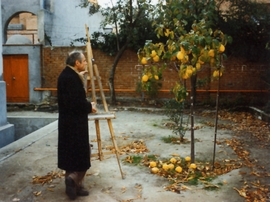 López García was the subject of Víctor Erice's 1992 film El Sol del Membrillo (The Quince Tree of the Sun), which closely chronicles the artist's attempts to paint a quince tree. The renowned Madrid figurative painter, Antonio López García, sets up his easel in front of a quince tree. 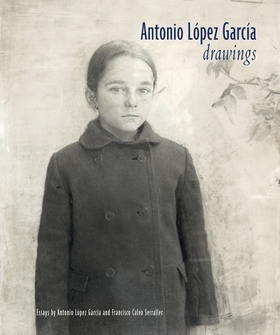 Featured image is reproduced from Antonio López García: Drawings. I was about to finish my accounting studies in order to find a job in an office or a store in town, but I was becoming increasingly interested in drawing. In June of 1949, though I hadn't even thought of saying anything to him, my uncle Antonio decided it was time to take me under his wing. He told me that the copies I had been making, that I liked so much, were not what I should be doing, and that I should start drawing from life. At my grandparents' house, where he lived, in a little kitchen that opened onto a large courtyard, he set against the wall the subject of his latest painting: a small, unvarnished wooden table with scissor legs. The table was partly covered with a white cloth that had a narrow, reddish stripe on the edge, and on top of this was a terracotta cooking pot, a halved onion, and a big, round loaf of bread, marked with a cross and with a portion missing. He gave me a piece of paper from a pad and told me to draw. I sat on a low chair, very close to the subject, and started doing so. With some rough outlines, I easily fit the subject onto the paper. I was surprised by what I was capable of doing. I eagerly went back every day, using my pencil to carefully describe the table in perspective, the proportions of objects in relation to each other, the material character of each thing. Using chiaroscuro, I drew lines on the paper with my pencil, trying to achieve the volume of the shapes, the roughness of the whitewashed wall, the shadow of the objects on the tabletop, and the grain of the table's wood. I was surprised to see how the image slowly emerged on the paper, but I was also slightly disappointed in the result; it seemed feeble to me, compared to the copies of the 19th-century paintings that I had been drawing not long before. Every once in a while, my uncle would approach me to make a comment, but he mostly left me alone. When I expressed my doubts, he told me that, despite the modest results of my effort, this was the real way to draw. I worked on the drawing tirelessly for about twenty days and when I felt it was finished, I took it home and showed it to my parents, feeling that I had achieved little, but that maybe, as my uncle Antonio had said, that little was exactly what it was supposed to be. Antonio López García, excerpted from Drawings. 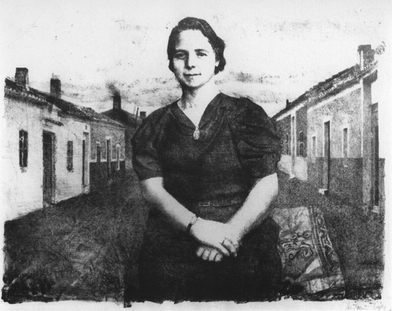 Text by José M. Faerna. FORMAT: Hbk, 9.5 x 11.5 in. / 200 pgs / 200 color.